The Epson SureColor SC-T3200 24-inch printer is a productive large-format printer that was designed for printing CAD, GIS and graphics applications. 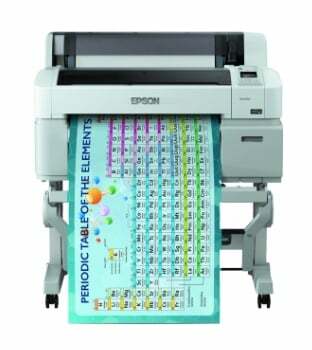 It’s popularly used in commercial printing, copy shops, engineering, architecture and educational environments. The SureColor SC-T3200 colour inkjet printer has good print speeds and resolution, is compatible with a variety of operating systems and has low noise levels. The Epson SureColor SC-T3200 4 colour large-format inkjet printer measures 1,050‎ x 813 x 1,117mm and comes complete with its very own stand. It's a front operation printer, which means that it can easily fit into any office environment. For connectivity, USB and Ethernet ports are available, while its 6.8cm LCD display sits conveniently on the top of the Epson SureColor SC-T3200 CAD printer. The Epson SureColor SCT3200 inkjet printer is able to print on media as wide as 610mm and as thick as 1.5mm. It can print clear, vibrant pages at a resolution of 2,880 x 1,440dpi. The Epson SC-T3200 also features borderless printing, has an automatic cutter and can support a variety of media sizes, including A1, A4, B2 and B4. What’s more, the Epson SC T3200 large-format printer has the option of using 110, 350 and 700 ml ink cartridges, making it extremely economical. The SureColor SCT3200 CAD / GIS printer is ideal for printing vibrant graphics that are smudge and water resistant thanks to UltraChrome XD pigment ink found in original Epson SC-T3200 printer cartridges. Though the Epson SC-T3200 SureColor printer has a duplexer, it’s a manual one, and it would be more productive if it had an automatic duplexer. It would also be more handy if the SC-T3200 4 colour printer came with wireless connectivity.